We thought you would like to know has been eyeing up our Blue Volcanic Vase for some time now and has requested we bring it your attention. 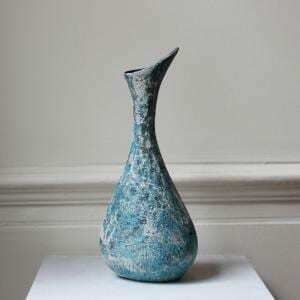 What's your question about Blue Volcanic Vase? This intriguing Blue Volcanic vase has been finished with a highly textured volcanic glaze. These unusually shaped vases are beautiful on their own or paired with a taller volcanic vase. 13" x 15" x 14"